When people ask what her "secret" is, she laughs, as she honestly cannot believe she is 100. That's a big part of what aging well looks like, too. Of all the lessons my mother leaves those who know her, is her love of living and desire to be here. To be active, to contribute and to live life to the max, regardless of your circumstances. Can you imagine living to 100? With no conditions attached. No saying, "As long as I'm healthy" or "As long as I have all my senses." No qualifications, either. "Only if the people I love live that long, too." Just unconditionally saying "YES" to living to 100. Living is the keyword. So is the word "yes." I'm very fortunate to have my mother Lillian as a shining example of what is possible when it comes to living life fully and making it to 100. 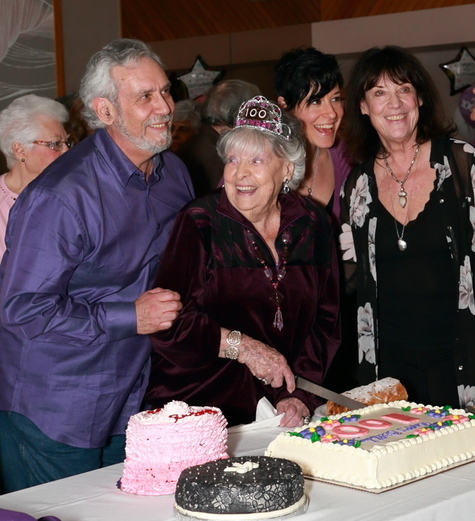 On March 2 she celebrated her 100th birthday with family and friends and then on March 13, my brother Niel, my daughter Lani and I threw a birthday celebration party to honour her. It's funny when people ask me if someone who is 100 still has any friends. Just ask the 100-plus people who showed up for the party if it is still possible to have friends at 100. Yes, it is, and lots of them. My mother laughs and says, "I guess people kind of like me." I often joke with her that she has a more vibrant social life than I do. My mother is an outlier when it comes to aging. She is truly an inspiration of possibility when it comes to aging gracefully and remaining vital and alive. When you look into her endless blue eyes, you see what true vitality looks like. My mother is beautiful. She redefines what the word "beauty" means at any age. We live in a culture that is obsessed with youthful beauty and because of this obsession, we rob ourselves of the great gift of wisdom and beauty that someone like my mother can teach us. The world seems focused on how the younger generation has much to teach the older generation because of their facility with technology. Maybe we've got that very wrong. My belief is that the lessons the older generation has to teach the younger generation are monumental in comparison. Lessons about socializing and being happy with less. About honouring people and about the power of connecting person to person with the ability to have real conversations face-to-face. Many of the lessons I shared in "Five Key Lessons the Over 90 Generation Can Teach Us." My mother defies what is possible when it comes to healing as well. Until the age of 96, she had never been in the hospital overnight other than to have my brother and myself. On a cold February day in 2012, getting into the car to go shopping with her friend, she accidentally caught her foot on the bottom of the car door and twisted it badly enough that she fell out of the car to the ground. My daughter and I rushed to her side, giving her arnica and rescue remedy as we waited for the ambulance. She was in shock and didn't seem to be in pain, but the full extent of the injury was only revealed once we got to the hospital. Her ankle bones were shattered, protruding from both sides of her foot. We had a young, compassionate surgeon who after assessing the injury, strongly suggested that amputation was the best option. What? Of course, he didn't know my mother! He said because of her age, her very thin skin and the extent of the damage, it was very unlikely they could repair it so she would ever be able to walk again. My daughter and I cried as we told him amputation was not an option. Knowing my mother and her love of "gallivanting," being out and mobile, the only option was for him to figure out how to fix it. We begged him to call on all the surgical magic he knew and repair her ankle. He reluctantly agreed to try. The surgery took six hours. My daughter and I huddled together in the hospital waiting room as the hours dragged by into the wee hours of the morning. We were anxious for any news. They had a challenge with the anesthetic because of her age. Her skin kept disintegrating with every stitch the surgery team made to sew her ankle back together after they inserted the rods to hold her bones together. There was skepticism to whether it would even heal. Her recovery was long and there were many, many setbacks along the way. All her caregivers fell in love with her and her positive mindset. I'd been invited to go to Peru with World Neighbors and didn't see how I could possibly accept that offer and leave her. She insisted I go, as did all the people in the rehab centre. My mother defied the odds. Her strong will carried her through and she took on this new challenge at age 96, coming through it with remarkable strength and resilience. The surgeon still cannot believe that she healed enough to walk again, considering his original prognosis. Although she has to use a walker for balance, we often laugh that keeping up with her is tough as she has mastered the art of "speed-walkering." My mother is an example of how a strong will, coupled with perseverance and determination, can literally keep you moving forward in life. Observing younger generations, I wonder if they have this kind of strong will that many in my mother's generation have. My mother's attitude has always been more important than all the other factors the "forever young" generation has become somewhat fixated on. She never was very concerned about the food she ate, and as a young girl she was a consummate athlete, something our younger generations haven't taken up in the way my mother's generation did. My mother all but lived at the local park where she learned to knit and crochet, play baseball, volleyball, and learned to swim and skate. It was less about competition and more about socializing. The quality of food during her formative years was much cleaner and nutrient-dense then the adulterated, depleted and processed foods readily available now. Here's just a few staggering statistics showing the decline in our food's nutrient density. Calcium in broccoli is down 50 per cent and Iron in watercress is down 88 per cent from 1975 to 2001. Vitamin A in apples is down 41 per cent (1963 to 2001). There have been many other changes in farming over the past 100 plus years, and most of them have resulted in a loss of nutrients as well. Among these are synthetic fertilizers, pesticides, genetic modification, storage of foods for later use, shipping foods long distances and not replacing all the nutrients depleted with each crop. Seems like my mother's generation had a huge advantage over later generations when it comes to food, confirming why we need high quality nutritional supplements to stay healthy and vital today. We simply cannot get all our nutrition from food, regardless of how good the quality. Of all the things people love about my mother is her "Talk yourself out of it" mindset that has been the cornerstone of her resilience, strength and love of life. When people ask what her "secret" is, she laughs, as she honestly cannot believe she is 100. That's a big part of what aging well looks like, too. Staying young at heart and of mind and not buying into the number that is on your birth certificate. Of all the lessons my mother leaves those who know her, is her love of living and desire to be here. To be active, to contribute and to live life to the max, regardless of your circumstances. 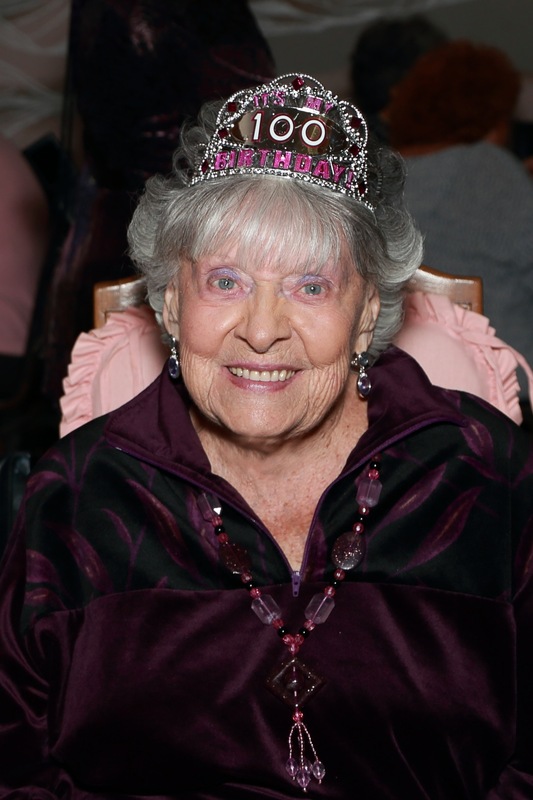 A true lesson in what living to 100 can look like!